For the past 15 years, the Brigade has offered specialist advice and support to BB Companies wishing to welcome children and young people with disabilities or impairments. We call this network of advisers the Disability Advice Network or DAN. The advisers are BB Leaders, and former BB Leaders, who through their own experience or in their professional lives, have the skills and knowledge to help other BB Leaders who want to make their own Companies more welcoming and inclusive. The network is set up to support and advise any Company or individual on a range of disability issues. For example, if you would like to include children or young people with particular needs or disabilities, then an adviser will be able to suggest practical ways of going about this. The advisers will also be able to help with achieving the highest standards of accessibility and good practice in working with disabled young people. We are very pleased to welcome new DAN adviser, Craig Happell. Craig is the Queen’s Badge Adviser for the West Lowland area in Scotland. Craig says “I lost most of my sight and was registered blind around 12 years ago. I applied for my first Guide Dog, Casey, shortly after and he worked with me for 8 years before retiring aged 10. 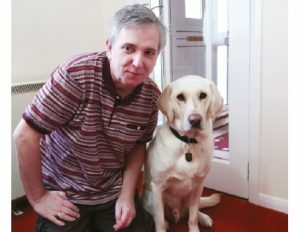 My new Guide Dog, Merlin, arrived last September and I’ve worked with him since then. As someone who lost their sight later in life I am more aware of what is expected or required to make life easier for those with a visual impairment. If you would like support or advice in welcoming or working with a child with a disability or impairment, then contact Karen Jay (karen.jay@boys-brigade.org.uk) at BBHQ and she will put you in contact with the most appropriate adviser for your needs. There is also a disability app created by one of our DAN members in Northern Ireland, Colin Millar. This app is available free for Apple and Android devices – search “Boys’ Brigade Disability App”.